Close view of centre of east façade of Ibrahim Rauza Mosque, Bijapur. bl.uk > Online Gallery Home	> Online exhibitions	> Asia, Pacific and Africa Collections	> Close view of centre of east façade of Ibrahim Rauza Mosque, Bijapur. 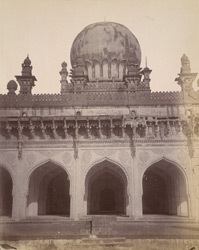 Photograph of the Ibrahim Rauza mosque in Bijapur, Karnataka, from the Archaeological Survey of India Collections and attributed to Henry Hardy Cole in Bloch's list (the attribution is probably incorrect). The Adil Shahi dynasty ruled parts of southern India from the late 15th to the late 17th centuries, with their capital in Bijapur. The dynasty was founded by the Persian governor of Bijapur, Yusuf Adil Shah, who declared his independence from the declining Bahmani kingdom of the Deccan. Rulers of the dynasty such as Ibrahim Adil Shah II (r.1580-1627) were great patrons of art and architecture. With Mughal rule expanding to the Deccan, Bijapur was no longer able to evade confrontation with the Mughals and fell to Aurangzeb, after which its importance faded. The Ibrahim Rauza (1627) is the mausoleum complex where Ibrahim Adil Shah II is buried with his queen, Taj Sultana. Exceptionally conceived and finely decorated, it is one of the supreme achievements of the Adil Shahis. Designed by a Persian architect, Malik Sandal, the tomb and a mosque are set in a walled garden facing each other over an ornamental pond. Graceful minarets mark the corners of each building, surmounted by a dome rising from a lotus petal base. The tomb is supposed to have been an inspiration for the Taj Mahal at Agra. This view of the mosque shows three of the five central arches of the screen, with the dome behind.